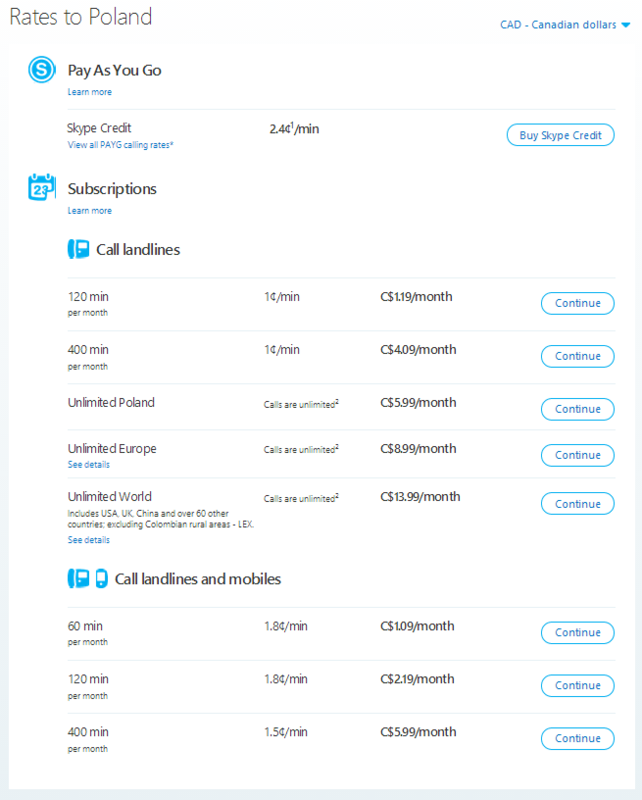 I'm travelling to Canada and I need to make cheap phone calls from Canada to Poland. Are there any cheap prepaid cell phone operators or fixed lines? If you can, please add some prices for example. I like this option because all you need is a credit card and internet connection. You can make calls from your computer or a smartphone with the Skype app. Two calling cards off the top of my head: CiCi and Vox. Note that to use this option, you will need a land line or cellphone and based on the plan you get, you may be bound by the number of free minutes to local numbers (when using a calling card, you call a local number). Since you might be getting a cell phone while in Canada anyway, Wind Mobile offers good rates to Poland. The good news is that each of the three options are decent in my opinion. Evaluate your needs (i.e. do you already have a phone and whether you are calling a Polish land line or cellphone or both) and pick the option that works for you! Yes best bet is to get a local number plus a calling card. Usually at hotels, local calls are free which takes care of the first part. If you must use a cell phone, than any prepaid number will do. It costs under $10 for the SIM and you can load in increments of $10 with most plans. We do not have many providers and you have to do the work to find out which one works with the cellphone you have. Rogers, Telus and Bell are the major ones and your best bets. In either case, you dial a local number and use a calling card to bride between the local call to the long distance one. These are many of these cards available in convenience stores. Calls are a few cents per minute and are bought (also) in $10 increments usually. The card I personally use is a Yak Travel Card. 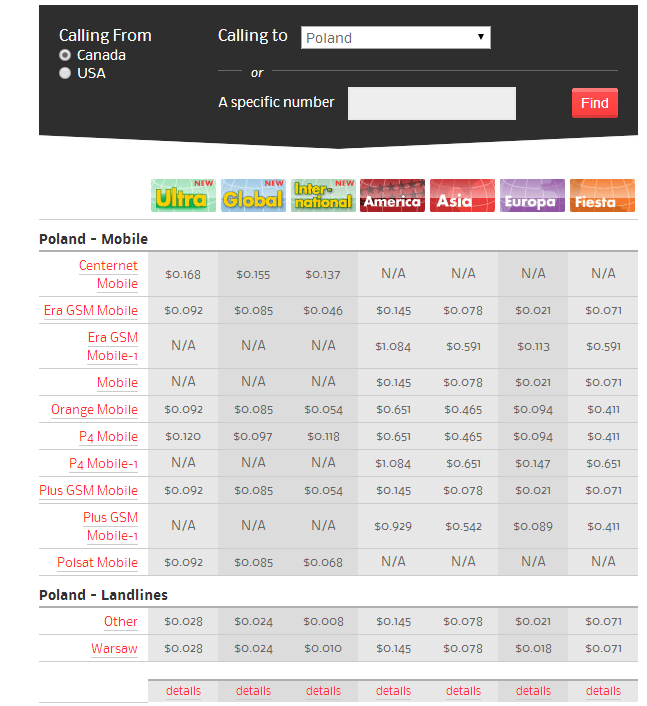 Using a local number, it costs 3.9c/m to call to Poland. You can also use that card to call from a payphone for an extra 5c/m, so a total of 8.9c/m to Poland. Skype out can be used to to call land lines or mobile phones pretty reasonably from computers and some other devices capable of running Skype. It's a couple cents a minute to Poland, IIRC, so basically almost free. I am surprised nobody mentions VOIP. With VOIP you technically have a fixed line number that works over an internet connection. There are various apps for both iOS and Android. I personally like Zoiper. My current provider offers polish numbers which will work over a Canadian internet connection. So your friends and relatives can simply call you in Canada as if you are in Poland. You can call fixed and gsm lines. Usually calling fixed lines is free. The beauty of Voip is that you don't have to explain voip, or skype. People can still reach you with existing technology, i.e. any phone, on an existing phone number. Not the answer you're looking for? Browse other questions tagged canada cellphones poland communication or ask your own question.